In the world of long-term food storage, canned food still stands as one of the best options. Canned food is widely available, easy to store, has a long shelf life, and is typically cheap. There is also a wide variety so you can find the best canned food for your crowd at home based on their taste buds and the nutritional value of what you are storing. Dehydrators, dryers, and vacuum seals are great for food storage but store-bought canned foods have one thing on all of them: they are simple. One of the easiest ways to begin a food-storage plan is to simply buy a few extra canned goods at each trip to the grocery store. This method, called back stocking, can help you build an initial food storage supply. 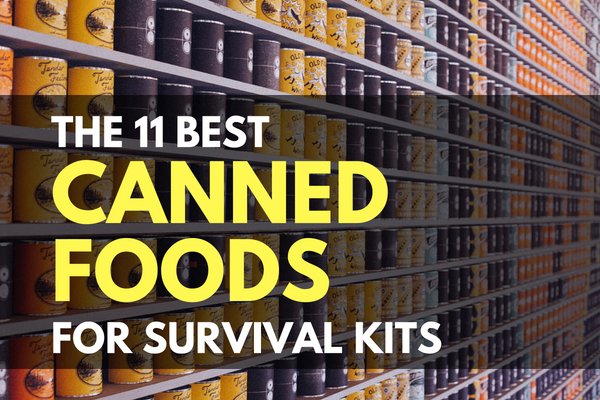 Later, once you add in more bulk goods, these can still serve to add variety and nutritional value to your survival kit. We use diced tomatoes to make salsa with our homegrown peppers, so this is something that we are able to back stock easily in the pantry. Very cheap, versatile, and widely available. Corn goes great with all sorts of meals. The kids love it and it is an easy way to add a vegetable to the table. Green beans have been a long-time canned staple. Homesteaders may prefer growing and canning your own, but getting them from your local grocery store is quick and easy. Rice and beans are typically stored dry and do not need to be canned, but baked beans are just too good to pass up. They can add much-needed variety to your food stash and are usually a family favorite. I actually prefer Tuna in water- but in an emergency calorie content is king. The oil adds valuable calories instead of water. Stashing too much tuna- or any fish for that matter- could be problematic long term with mercury content. Chili is just one of those feel-good foods that happens to be great for emergencies. It is no surprise that it is one of our favorite MRE entrees. Luckily, it comes in a can and is dirt-cheap. Protein power. Canned roast beef is a great emergency entrée. Just heat and eat. Similar to the canned roast beef above, but even a little more versatile. You can splash other ingredients into the stew for different meals using the same building blocks. My wife uses this to make buffalo chicken dip and it’s crazy delicious. This lets us back stock our pantry with these cans pretty easily. Good old SPAM. This Shoulder of Pork and HAM is about as versatile as it gets when it comes to canned meat. It has been a food storage staple for a long time and should not be surprising that it made the list. Bulging cans. This is an indication of temperature problems during storage or bacteria growth. Either way, don’t eat it. Leaking cans. If a can is dripping, oozing, seeping, etc- don’t eat it. A compromised canned good can go bad quickly. Open cans. If you open a can, plan to use it all. Resealing a can is difficult and does not trap sterile air back in the can. If a can has a hole in it and is already slightly open, don’t eat it. Cans that don’t meet the cut for any of these flags aren’t completely useless: use them for target practice. You know you and your family’s preferences better than anyone does. Everyone in my family will gladly chow down on any of the canned goods listed above- especially the kiddos. Don’t get into an emergency situation just to find out that nobody likes your emergency food. Canned foods make it easy, since they are usually something that your family is familiar with already. It can be surprising just how big of an impact something like a familiar meal can have during an emergency. 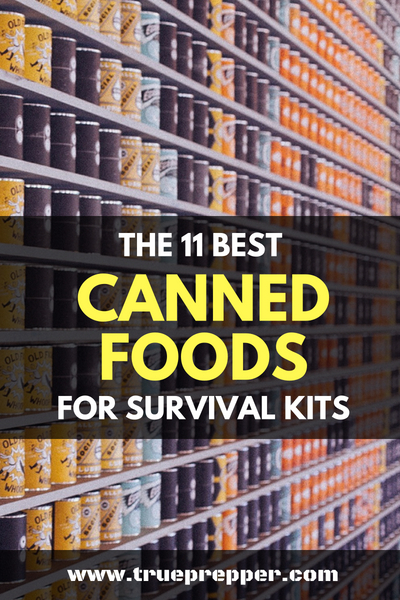 Canned foods are easy to find locally and can help boost your survival kit rations. Boost your calories, variety, and nutrition with canned foods. They are inexpensive, which can help any prepper; whether you already have a long-term storage plan or are just starting out. If we missed any of your favorite canned foods that you keep in your stash, be sure to let us know in the comments below. Keep exploring, stay prepared, and be safe. Almost all modern commercially packed canned foods are shelf-stable and will remain edible nearly ‘forever’ if the cans are intact and stored at temperatures comfortable for people. Excessive heat or repeated large changes in temperature are problems, but if you keep your canned food indoors in your living space they will probably last as long as you do. HOWEVER, the above does NOT apply to “canned” frozen products like concentrated fruit juice or refrigerated products like bread and pastry dough – these products need to be kept at the appropriate temperatures. If kept properly most will last a bit past the “use by” date (especially frozen products, but not nearly as long for refrigerated products). None of the frozen or refrigerated products will last as long as regular shelf-stable canned goods.